First, knit the swatch. Second, count the stitches! In yesterday’s post we talked a bit about swatching for your knitting projects. This is a great tool for large projects like sweaters. Once you’ve knitted your swatch, washed it, and let it dry, then use whatever tools you have available to help you count out your stitches and rows to get your gauge measurement. Measuring your stitches on the swatch is simple and can be done with basic tools. 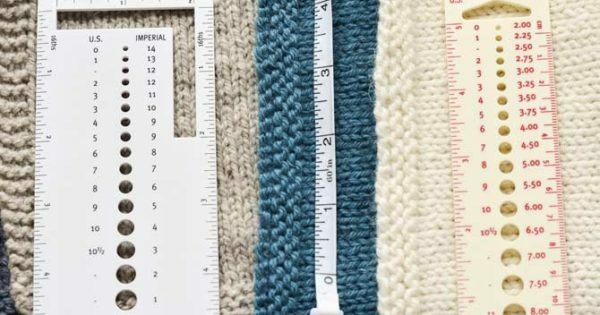 At the very least you need a tape measure (I admit I carry one around in my purse, in case I need it handy), but there are also several knitter tools out there specifically to help you. Most knitting patterns will tell you what gauge they are using for the pattern – this means, how many stitches per inch using a specific yarn. They’ll also tell you the needle size they used to get that gauge, for example “20 stitches and 28 rows over 4 inches/10 cm in stockinette stitch, on 4.5mm/US #7 needles.” This means that the pattern designer used 4.5mm needles with the yarn used in the pattern, and if we divide that out per inch she is getting 5 stitches per inch (sts/inch). So, that means that if we knit the same pattern, we also want to get 5 sts/inch. Measuring tapes are the simplest tools for counting stitch and row gauge. The simplest method of measuring your swatch for stitch and row count, is to lay a tape measure across your swatch, ensuring it lines up as evenly as possible just underneath a row of knitting. You can see in my blue swatch here, all the little stitches look like upside-down “Vs”, so counting stitches is simply a matter of counting the “Vs”. This is often the hardest part – simply visualizing the stitches can be challenging especially if you’re doing this at night, or if your yarn is a very dark color. You might find it easier to count stitches 2 at a time instead of 1 at a time. Count out how many stitches you’re getting over 4 inches (or as many inches as you are able), and then turn the ruler or tape measure vertically and do the same thing for number of rows. Divide by 4 to get the sts/inch and rows/inch numbers for quick reference. Write down these numbers! Then compare to what the pattern tells you it’s looking for. Some tools will give you little cut-out windows, like this one below, that block out just a couple of inches of space. This makes counting even easier. If you don’t have a tool like this, you can also use masking tape or post-it notes to get the same kind of effect. I like gauge rulers like these because they also have holes to check needle size, and I try to keep one in my needle case. A helpful window for visualizing stitches on your swatch. What should you do if you’re not “getting gauge?” The best option is to change your needle size. If your gauge is too tight (you have more stitches per inch than you need), then change to a larger needle, and knit another swatch. If your gauge is too loose (too few stitches per inch), change to a smaller needle. You might also need to change yarns. For example, if you have too many stitches per inch and your swatch feels very loose already, increasing your needle size might give you correct gauge but not the right kind of sturdy fabric you need. In that case, you might need to choose a slightly heavier yarn to get the effect you want. Swatching might seem intimidating at first, or sometimes even unnecessary if you’re the kind of knitter who gets very predictable tension all the time. However, it can’t hurt to make sure before casting on! Also don’t forget to keep your measuring tape handy while you’re knitting, as well, to see if you’re still on track during the project. Measuring your stitches is a good habit to get into, before and during your knitting projects!